Confocal immunofluorescent analysis of rat pancreas using Insulin (C27C9) Rabbit mAb (Alexa Fluor® 647 Conjugate) (blue pseudocolor). Actin filaments are labeled with Alexa Fluor® 488 phalloidin (green). Red = Propidium Iodide (PI)/RNase Staining Solution #4087. Flow cytometric analysis of Hela cells (blue) and B-TC-6 cells (green) using Insulin (C27C9) Rabbit mAb (Alexa Fluor® 647 Conjugate) (solid lines) or a concentration-matched Rabbit (DA1E) mAb IgG XP® Isotype Control (Alexa Fluor® 647 Conjugate) #2985 (dashed lines). 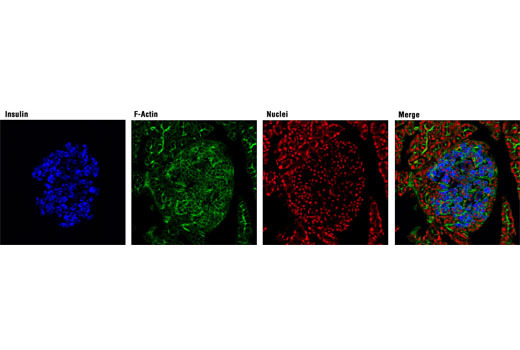 Insulin (C27C9) Rabbit mAb (Alexa Fluor® 647 Conjugate) recognizes endogenous levels of total insulin protein. 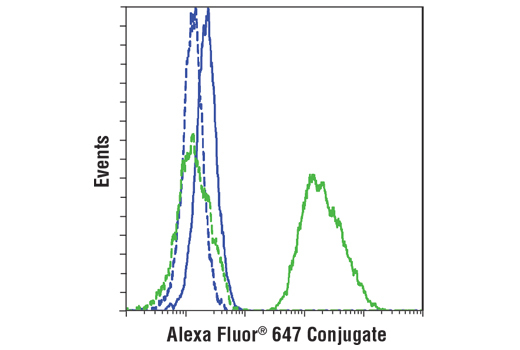 This Cell Signaling Technology antibody is conjugated to Alexa Fluor® 647 fluorescent dye and tested in-house for direct immunofluorescent analysis in rat cells and flow cytometry in mouse cells. The antibody is expected to exhibit the same species cross-reactivity as the unconjugated Insulin (C27C9) Rabbit mAb #3014.